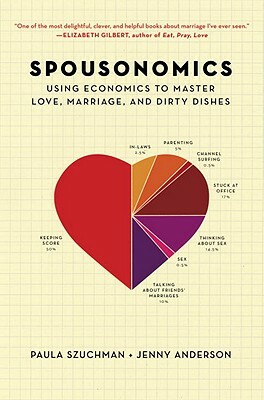 Spousonomics is the ultimate marriage book for nerds: one part econ, one part marriage advice. Wait, don't stop there, please. Both of those words make the book sounds boring and stuffy. Econ? Blah. Marriage advice? Gag me. But no. It's not like that. Spousonomics is witty and fun, and even though some of the econ-to-real-life-in-your-marriage examples can be a stretch, the principles (both the econ ones and the marriage ones) are absolutely understandable. At times, in fact, the book can actually be too simple, boiling down complex economic theory into vocabulary less stimulating than that to be found in the "For Dummies" series. Despite the tendency to over-simplify, though, and the subject's predisposition to be dull or unexciting, Spousonomics is, actually, engaging, at times funny, and mostly relevant. Of course, the recommendations would be more applicable if my husband read the book too, but I'm not holding my breath on that one. Regardless, Spousonomics is a quick read, the kind that can be taken chapter by chapter or bit by bit, and while the advice contained within is not life-altering, it is, at the very least, eye-opening to know that I am not alone in any or all of the insanities that make up a marriage. Note: Spousonomics is being re-published in paperback as It's Not You, It's the Dishes in May 2012. You read a book called "Spousonomics" and still have 17 Hemingway books on your 'to read list'?